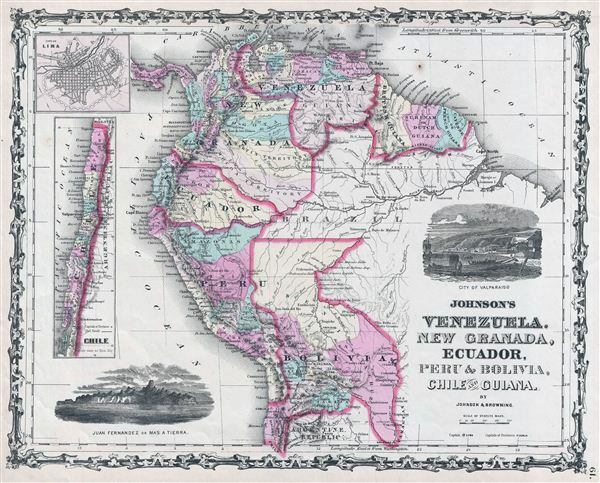 Johnson's Venezuela, New Granada, Ecuador, Peru & Bolivia, Chile and Guiana. A very attractive example of A. J. Johnson and R. Browning's 1861 map of the northwestern part of South America. Includes Bolivia, Peru, ecuador, New Granada (Colombia), Venezuela, British Guiana, Surinam, French Guiana and Chile as well as adjacent portions of the Brazil, particularly the Amazon. Offers excellent detail both along the coast and inland, especially along navigable rivers. Notes numerous jungle waterfalls. The Amazon region is unsurprisingly vague though a few river ways and missionary stations are noted. Inset maps along the left border detail Chile and Lima. An engraved view in the lower left quadrant shows the Juan Fernandez Islands. Another inset at right center shows Valparaiso. As this map was being drawn this region was in the midst of political upheaval and civil war. Venezuela was in the midst of its bloody Federal War (1859-1863) in which a significant percentage of the population perished. Colombia was then under the Confederación Granadina, a short lived federal republic that consisted of modern day Colombia and Panama. The Confederación, facing strong opposition from both liberal and conservative elements, disolved in 1863 in the midst of the Colombian Civil War (1860 – 1862). Features the strapwork style border common to Johnson's atlas work from 1860 to 1863. Published by A. J. Johnson and Browning as plate numbers 59-60 in the 1861 edition of Johnson's New Illustrated Family Atlas. This is the last edition of the Johnson Atlas to bear the 'Johnson and Browning' imprint. Subsequent editions reflect Ward's 1862 acquisition Ross C. Browning's shares in the firm.